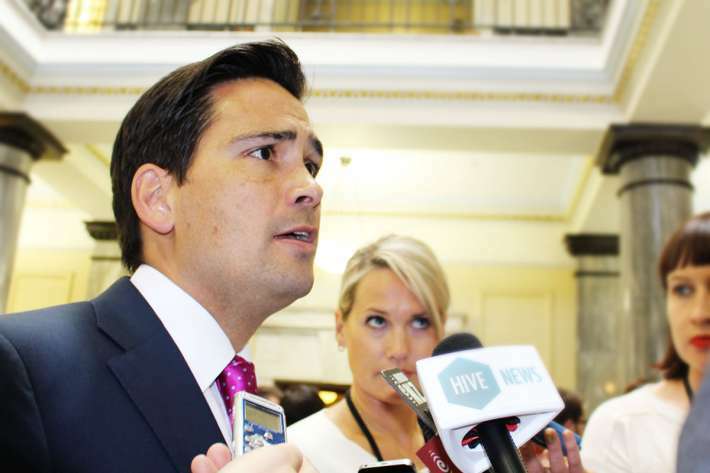 Energy and Transport Minister Simon Bridges talking to reporters in Parliament on Feb 18. By Lynn Grieveson/Hive News. Energy and Transport Minister Simon Bridges has formally warned the main petrol retailers about excessive profit margins, which coincided with a fall in profit margins back to levels seen before the slump in crude oil prices late last year. Bridges was commenting after a call last month from the Automobile Association to the Minister for an independent inquiry into petrol company profit margins and a call from Labour MP Stuart Nash yesterday for a Finance and Expenditure select committe inquiry into fuel company profit margins. As detailed in this January 18 article from David Chaston, profit margins surged to an average 51 cents a litre through the second half of July as fuel companies, including Z Energy, BP, Caltex and Mobil, did not pass on all of the benefits of a halving of the crude oil prices. They had averaged 42 cents a litre through calendar 2013 and 46c a litre in the first half of 2014. MBIE figures showed the profit margins dropped to 45c by late January, although it remains well above the 30-35c/litre seen from 2004 to 2010 and more than double the 15c/litre seen before 2008. See third tab in chart below for MBIE figures for oil importer margins. Bridges said he had asked for weekly reports on margins from his officials from late December and wrote a letter to retailers on February 3 saying he was disappointed by the rise in margins, which "does not indicate an entirely vibrant competitive market." The full copy of the letter is here. "Petrol margins or importer margins were something I was concerned about at the end of last year because we'd seen that massive fall in international crude prices, and I don't think that flowed through to the consumer quickly enough from the petrol," Bridges told reporters before Parliamentary Question Time on Thursday. "I instituted weekly reports and made it very clear to the petrol companies, the retailers, that I was watching them and we've seen now the margin fall right back to effectively where it was before the large crude price falls internationally to what I and MBIE think is an acceptable levels," he said. "It was something I was concerned about and I did take a look at and wrote to the petrol companies on. They are on notice that I am watching, and I do want to make sure that the big falls in crude prices are passed on to the consumer." He said a select committee or formal ministerial inquiry was not required. He said the Government had put the fuel companies on notice and was ready to take action if necessary, although he did not specify what those actions could be. "There are a wide array of steps that could be taken, but that's not a position we're in," he said. "Were I to see those margins come up in a big way, I'd have to consider my options." Bridges pointed to the MBIE figures on profit margins as a way to keep the industry honest. "Sunlight is the best form of disinfectant," he said. Asked if the market was competitive when it reacted to a ministerial letter, he said: "I'd love to think that I had that power. They were coming down around the time in late December early January that I was, if you like, onto them." Bridges' office later released a copy of the letter, which was sent to Chevron NZ (Caltex), Mobil NZ, Z Energy, BP NZ and Gull NZ. "I am pleased that importer margins have fallen back somewhat this year, but I want to be very clear about my expectation that the benefits of falling input costs must be passed on to consumers more quickly and fully in future," Bridges said in the letter. "Obviously, if this does not occur, I will assess my options." Z Energy said MBIE data on fuel profit margins was no longer accurately measuring sales data or all of the costs that determine profit margins. CEO Mike Bennetts said through a statement that fuel companies were competing harder with a range of new ways to win customers, including through service, price discounting, loyalty offers and a wide range of discounts beyond the price board. These affected margins, but were not reflected in MBIE data. “MBIE has historically monitored and reported fuel importer margins, but this reporting has not kept up with rapidly changing competitive dynamics and the methodology is now flawed," Bennetts said. "As a result, the gap between this reported margin and Z’s actual margins has been growing and the quality of the data has become a problem that needs to be addressed," he said. I urge all fuel users to put as little in their tank as possible each week. When gouged, there is only one point that can be made, quickly and effectively. Cause a glut. Let them fill their tanks, not yours. Would work wonders with those other price gougers the Real Estate Land Bankers. But too many short sighted people would rather be Mortgage Slaves, to their oh so friendly banks and their Building mate cronies. But as most people are not even aware how they are gouged, that also seems a hopeless case. Maybe we need a Minister of Gouges in the NZ slow party shennanigans in the National interests. Simon says..way too late as usual. ..pick-me. I say, too little too late. Labour should have been on to it straight away. Fix problems, it would be so simple, if the problem was not the controllers of the supply and demand. Each week? More like each month, then we are talking! Aussie $ to Kiwi $ is almost at parity ! Perhapss if we didn't tax petrol so heavily to pay for our oversized roading budget to fund the governments roading lobby friends profits? Yes I am sure they are quaking in their boots after receiving Si's letter...."must try harder". I wonder if he is shouting them out to a another lavish dinner in Queenstown this month? Nothing Simon can do. The oil companies know that.